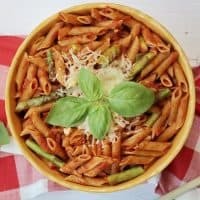 Whole wheat pasta with asparagus and marinara sauce is a quick and easy weeknight dinner option that the whole family will enjoy. You know my son, that adorable little blue-eyed-baby I brought home from the hospital just last summer? He is now a legit toddler. A toddler! After a day of working, household chores, and chasing my toddler around the house, the last thing that I want to do is spend a lot of time in the kitchen preparing dinner. I am always looking for new weeknight dinner ideas, especially healthy recipes that I can feel good about serving to my family. 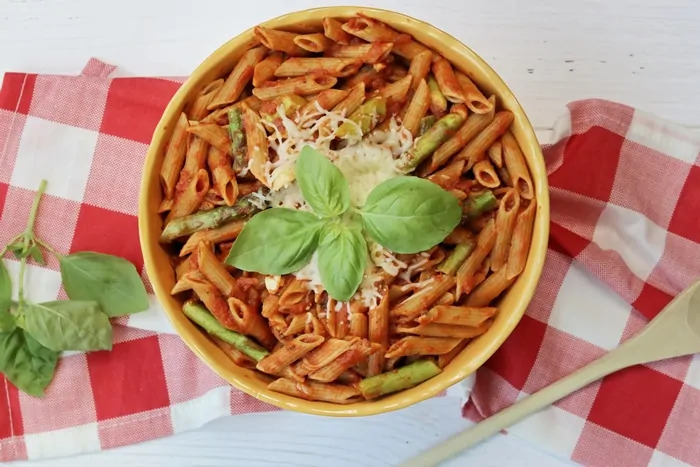 That is why I love a quick and easy dinner recipe like this 20-minute pasta with asparagus. 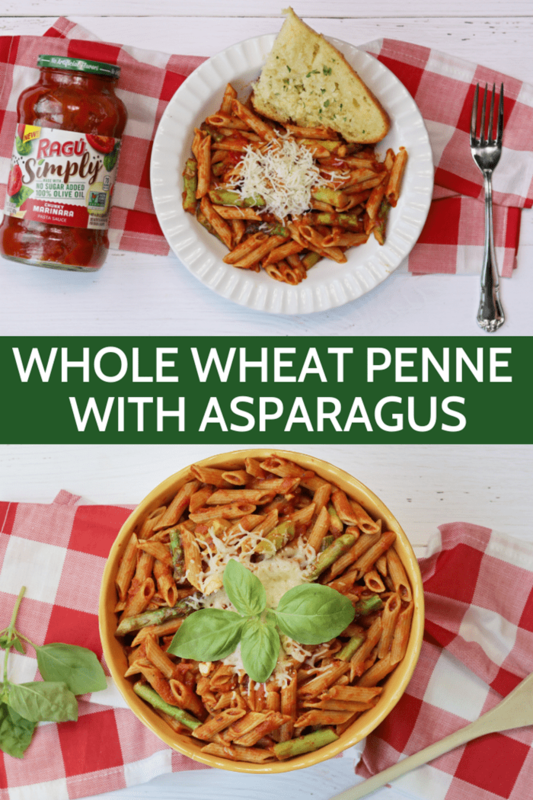 I paired whole wheat penne with asparagus and New RAGÚ® Simply Chunky Marinara Pasta Sauce for a healthy dinner option that comes together in under a half hour. 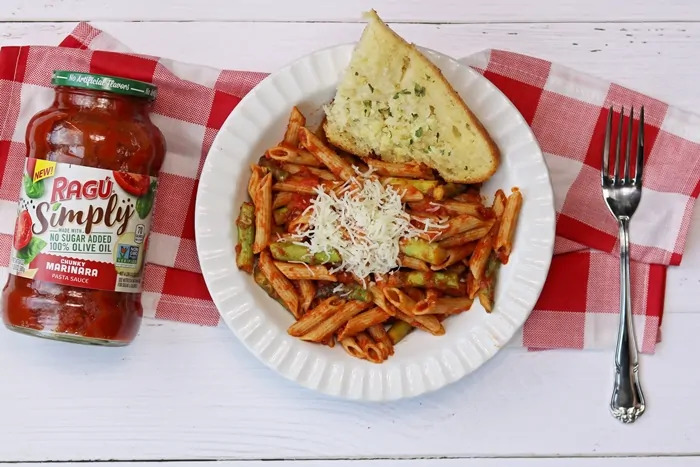 New RAGÚ® Simply Chunky Marinara Pasta Sauce helps me get a delicious dinner on the table for my family in minutes. This new RAGÚ sauce is made with 100% oil olive and contains no added sugar. 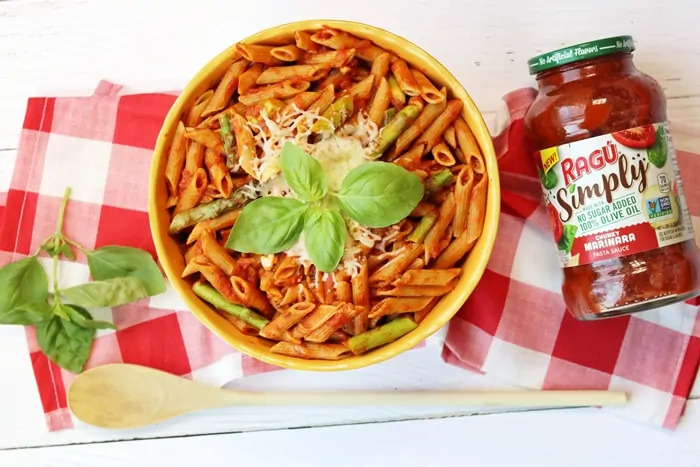 Packed with plump tomatoes, garlic, onion, and spices, New RAGÚ® Simply Chunky Marinara Pasta Sauce proves that simple ingredients can equal great flavor. 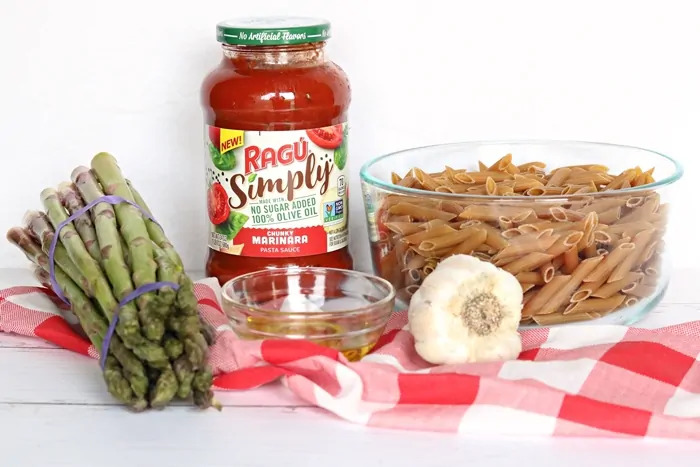 Be sure to stick around after the recipe to find out how you can enter for a chance to win a RAGÚ® SIMPLY PASTA SAUCE Prize Pack including RAGÚ® Simply Chunky Marinara Pasta Sauce! You will begin by preparing your pasta as directed on package. While the pasta is cooking, heat the olive oil on medium heat in a large skillet. 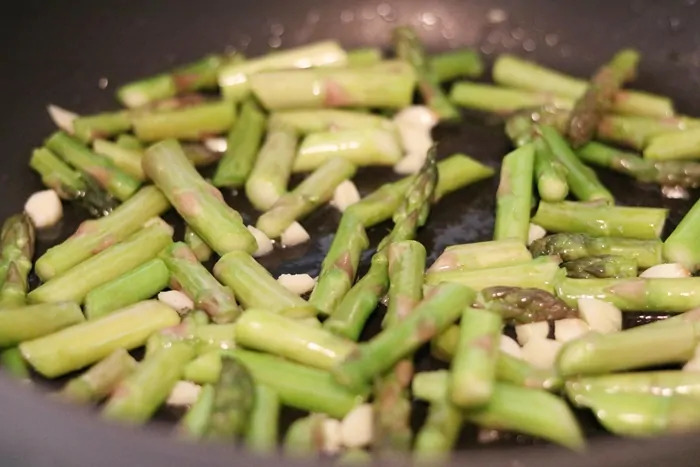 Add asparagus and garlic; cook 5 minutes, stirring frequently. 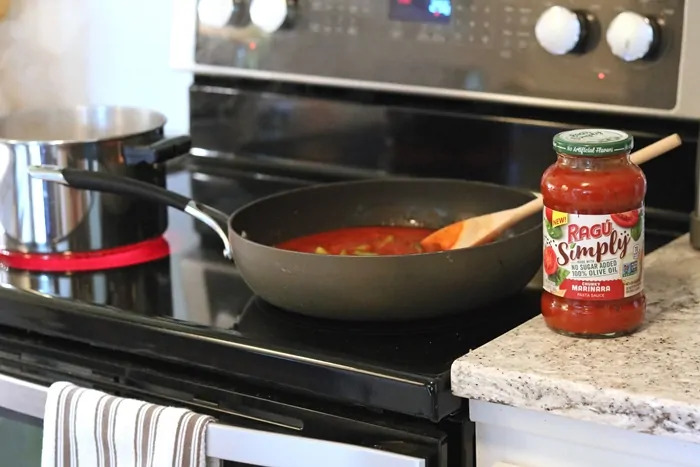 Add New RAGÚ® Simply Chunky Marinara Pasta Sauce to skillet and cook for 5 additional minutes, stirring occasionally. Pour over drained pasta. Toss to coat. Serve immediately. Garnish with shredded cheese and fresh basil, if desired. I hope that you and your family enjoy this easy weeknight dinner idea. For more easy recipe ideas that can be made with New RAGÚ® Simply Chunky Marinara Pasta Sauce, check out this Cauliflower Crust Mix & Match Pizza and this Quinoa Penne with Savory Tomato-Basil Sauce. Meanwhile, heat olive oil on medium heat in a large skillet. Add asparagus and garlic; cook 5 minutes, stirring frequently. Add marinara sauce to skillet and cook for 5 additional minutes, stirring occasionally. Pour sauce over drained pasta. Toss to coat. 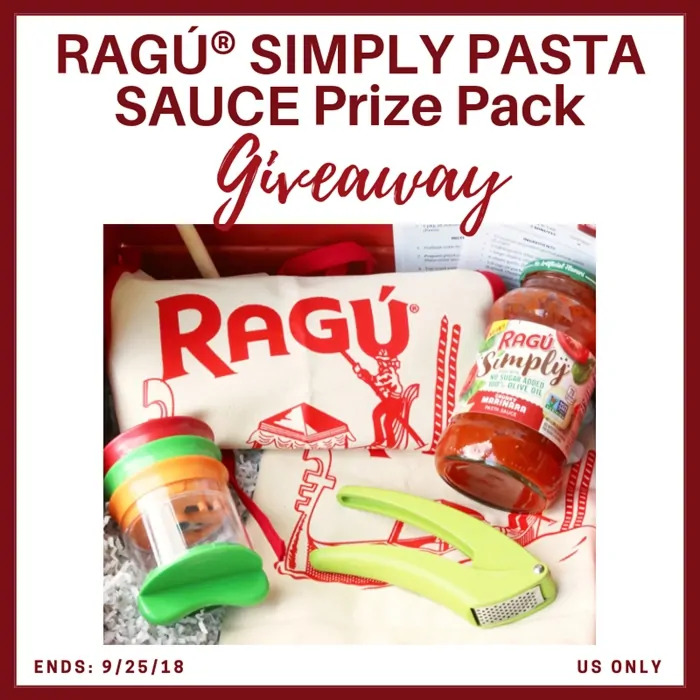 Enter for a chance to win a RAGÚ® SIMPLY PASTA SAUCE Prize Pack! 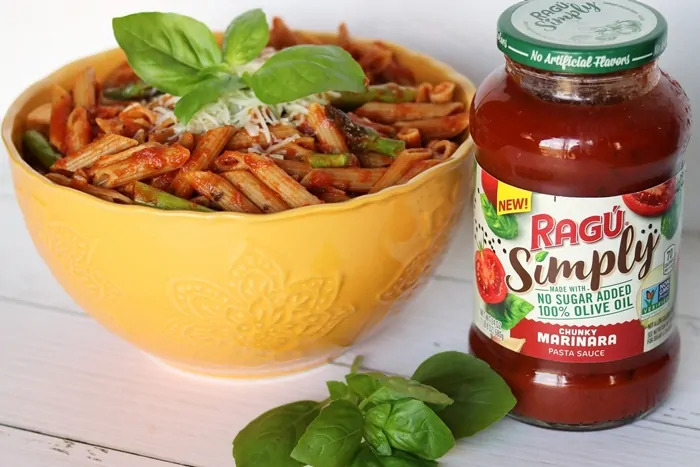 Use the Rafflecopter below to enter for a chance to win a RAGÚ® SIMPLY PASTA SAUCE Prize Pack including RAGÚ® Simply Chunky Marinara Pasta Sauce! Giveaway is open to US residents only and ends 9/25/18. Note: Sponsor is responsible for winner selection and prize fulfillment. I love meals that come together quickly like this and I appreciate that you’ve added some great green veg to the pasta! 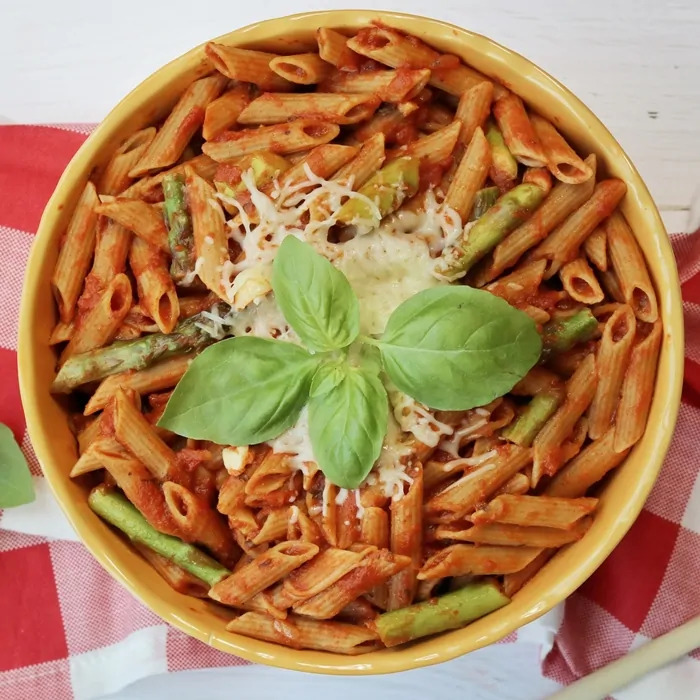 This pasta looks easy and delicious! I live in Rochester, Ny where Ragu started, so we are huge fans! Quick meals are always welcome on school nights and this looks like a tasty addition to the mix. Simple is what I need for my busy family!! I never cook with asparagus and I probably should. It would be a good veggie to add to meals!